In this episode, present day... present time! LOL! The gritty reboot- Digimon did it before Batman made it cool. It's a real travesty that some fans stopped watching after Zero Two, assuming that changing everything up spelled instant disaster. The business with the card game didn't help, but mostly it was the way the book suddenly closed on the characters we followed and fell in love with for two years. Going to a completely different cast so soon felt like blasphemy. Those who soldiered on were rewarded. The question of which season of Digimon is your favorite is a matter of personal preference. There are reasons to get behind every season. But this site is meant to gauge Digimon as anime, and under that criteria it's hard to argue that Tamers doesn't have the strongest offering. It has the pedigree, themes and imagery that appeal to both the mecha and cyberpunk crowds, and the deepest character analysis yet. This is the creative zenith of the Digimon franchise. The Konaka factor is huge. After penning a single episode of Zero Two (the darkest, creepiest episode of the bunch), writer Chiaki Konaka takes the helm in Tamers and his influence dominates the entire series. His signature work Serial Experiments Lain leaves fingerprints all over the show. Both shows touch on the blurring distinction between real and digital, with a bit of the existential thrown in as well. There's plenty of references to Lain, such as characters named after the protagonist's three friends Alice, Reika and Juri (the Juri in both shows even share the surname Katou). While the English version changes the latter two to Riley and Jeri, it adds a connection of its own: Jeri shares a voice actress with Lain. There are also some serious allusions to Neon Genesis Evangelion and plenty more Lovecraft nods along the way. It's also a sharp turn as far as the cast goes. Adventure spread the spotlight around a fantastic ensemble of eight kids, all with their own quirks and social issues. Tamers narrows the focus to just three, but in turn delves deeper into each of them and how they contrast with the other two. It may not be as colorful a roster, but we'll get a hard look at what makes Takato, Rika and Henry tick. And while the Digimon in Adventure had no shortage of personality, the Digimon in Tamers have some serious character depth in addition, particularly Renamon and Impmon. While the nostalgic romp through Adventure and Zero Two was fun, these next two seasons will be where this project gets really interesting. Tamers is my favorite season, with plenty of things to discuss. Frontier is my least favorite (for now), but has pockets of greatness and several individual episodes with some very interesting things going on. I hope you enjoy the ride. Now that it's over, Zero Two has been cataloged up above. There is also a new About page establishing System Restore's purpose, methodology and grading process, fleshing out the test post way back at the beginning. It also has my bio and e-mail contact. Once again, I'll be watching the Japanese version on Hulu regularly, but the blog is primarily centered around the dub. It's a good song, but closer to the bottom of my list than the top. This is the first time the show employs the trick of silhouetting future evolutions (it's subtle in Frontier's opening, but egregious in Savers). Legend has it that Jeri, Kazu and Suzie weren't originally going to become Tamers until after this opening was created. I look forward to your analysis of Tamers! 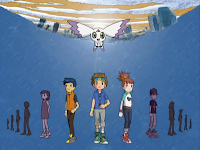 This is my own favorite season of the bunch for a lot of reasons, but overall it's a great deconstruction of Digimon as a whole. Konaka even mentioned on his website that one of his major aims with Tamers was to dissect the implications of things like monsters evolving, how the government would react to them, and so on. He knew what he was doing from the start and it shows. "Legend has it that Jeri, Kazu and Suzie weren't originally going to become Tamers until after this opening was created." Seems like Kenta was written to be a Tamer at the last minute too, even later than those three - notice how in the original opening, in the scenes where Kenta will eventually be shown in, the darkened silhouettes belonged to other people. The first appeared to be a boy with a different hair shape than Kenta's, the second isn't very visible, and the last one appears to be a boy with a humanoid Digimon that's obviously not MarineAngemon. I say "legend has it" because I'm a little skeptical about those three, especially given Jeri's role in the story (I'm a little more open to buying Kazu and Suzie). There's no denying that Kenta becoming a Tamer looked really tacked-on. Tamers is my favorite season and I'm looking forward to your journey through it. All the way in 2017, I've been reading through all your reviews of Adventure and Adventure 02 (takes a very long time, FYI, though not nearly as long as it took to write them, haha). I've given thought to watching the next seasons of Digimon over the years, since I fist watched the Japanese version about 5 years ago. 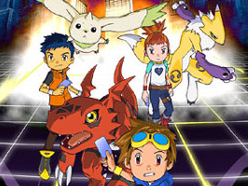 I had originally watched a little bit of Tamers when I was a kid, and dropped it and never really thought about Digimon again since I knew none of the new stuff was a continuation of the original story. I assumed I stopped watching it because I didn't want a show with new kids. Having now watched 14 episodes of Tamers, and having read your reviews of them after watching, I've come across a few spoilers (not actual spoilers, just mention of where it'll be heading because you already know) and I realised that I watched a lot more of Tamers than I thought I did. I definitely got past the time when Jeri becomes a Tamer, at least. So I guess my point in this is that Tamers was utterly forgettable to me in my childhood (teenage-hood, I'm pretty sure is more accurate?) I remember Digimon Aventure and 02, Sailor Moon, DBZ, Yu Gi Oh and whatever I watched around that time, but not a hint of memory of Digimon Tamers. It may have been the stage of life I was at, but that might say something about why Digimon was dropped by so many at Tamers if they had a similar experience. Watching it now, I can appreciate it (though it's definitely still doesn't overshadow Adventure in enjoyment), but I really don't think I did when I was young.